Undercurrents is a collection of fantasy worlds beneath the waves. The illustrations were originally featured in an audiovisual extravaganza at Reno's Peppermill Casino. There, they also featured on billboards, menu covers, etc..
To create the series, I visited every major aquarium from San Diego to Vancouver and captured thousands of reference images. Then, over the course of six months, these and many other illustrations came to be. The idea is to create groupings with different sizes and colors from the collection... like the one pictured below. 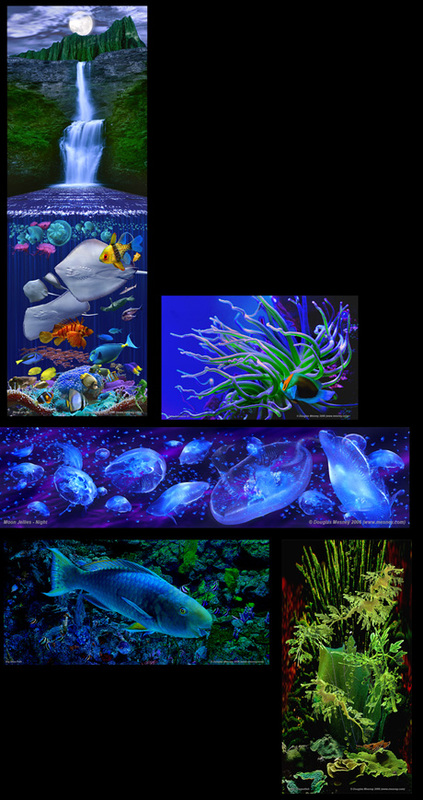 Nite Lites versions are really sensational because the blacklight creates a true underseas look and a three-dimensional quality. Click here to view the full Undercurrents Collection catalog. Click here for a trifold brochure of a partial Undercurrents Collection.